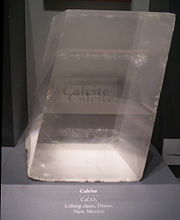 This 35-pound (16-kilogram) calcite crystal shows the property known as birefringence or double refraction. It was obtained from Iceberg claim, Dixon, New Mexico, and is on display at the National Museum of Natural History. It is one of the largest single crystals in the United States. Calcite is a carbonate mineral and is among the most widely distributed minerals on the Earth's surface. Chemically, it is known as calcium carbonate and has the formula CaCO3. It is usually white or colorless, but the presence of impurities can impart a wide variety of colors. In addition, it can be found in a variety of crystal habits. One of its well-known properties is called birefringence or double refraction, because of which objects viewed through a clear piece of calcite appear doubled. A model of the unit cell in crystals of calcite. Formed in various geological environments, constitutes about four percent of the Earth's crust. It is mined in huge quantities each year, particularly in the form of limestone and marble. It (especially as limestone) serves as an important building stone and a raw material for the manufacture of lime (calcium oxide), slaked lime (calcium hydroxide), and cement. It is used as a flux for smelting iron and steel, and (in pulverized form) as a soil conditioner. One variety, called Iceland spar, is valuable for optical equipment; another, called Mexican onyx (different from the quartz variety of onyx), is used as an ornamental stone. The name calcite is derived from the Greek word chalix, meaning "lime." This mineral is a common constituent of sedimentary rocks, particularly limestone, and is the primary mineral in metamorphic marble. It also occurs as a vein mineral in deposits from hot springs. In caverns, it is the main component of formations such as stalactites and stalagmites. Calcite is often the primary constituent of the shells of marine organisms. It is found, for instance, in plankton (such as coccoliths and planktic foraminifera), the hard parts of red algae, some sponges, brachiopods, echinoderms, most bryozoa, and parts of the shells of some bivalves, such as oysters and rudists. Usually white or colorless, calcite can also be found in shades of gray, red, yellow, green, blue, violet, brown, or black, when the mineral is charged with various impurities. It is transparent to opaque and has a vitreous (glassy) luster in crystallized forms. Some varieties exhibit fluorescence or phosphorescence. This mineral has a Mohs hardness of three and a specific gravity of 2.71. It reacts with acids to produce carbon dioxide, water, and calcium ions (that become dissolved in the water). The carbon dioxide bubbles out of the solution, and this effervescent reaction is used as a test when identifying the mineral. Calcite represents the stable form of calcium carbonate. It has two naturally occurring polymorphs: aragonite and vaterite. Aragonite changes to calcite at 470°C. 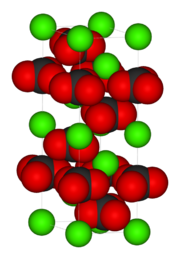 When exposed to water, vaterite converts to calcite (at low temperature) or aragonite (at about 60°C). Crystals of calcite are hexagonal-rhombohedral, though actual calcite rhombohedrons are rare in nature. They show a remarkable variety of habits, including acute to obtuse rhombohedrons, tabular forms, prisms, and various scalenohedrons. Moreover, calcite exhibits several twinning types, adding to the variety of observed forms. It occurs in fibrous, granular, lamellar, and compact forms. Cleavage is usually in three directions parallel to the rhombohedron form. Its fracture is conchoidal but difficult to obtain. A beautifully transparent variety discovered in Iceland is called Iceland spar. Much of this variety is now obtained from Mexico. Another crystalline form, called dogtooth spar for its dogtooth appearance, is composed of acute scalenohedral crystals. Single, transparent crystals of calcite display an optical property called birefringence or double refraction. This property involves the splitting of a ray of light into two rays when it passes through the crystal. Thus, objects viewed through a clear piece of calcite appear doubled in all their parts—a phenomenon first described by the Danish scientist Rasmus Bartholin in 1669. Calcite (especially as limestone) is an important building stone and a raw material for the manufacture of lime (calcium oxide), slaked lime (calcium hydroxide), cements, and mortars. It is useful as a flux (impurity remover) for the smelting of iron and steel. Crushed limestone is an aggregate for road construction, and pulverized limestone is a soil conditioner that neutralizes acidic soils. Iceland spar is valuable for optical equipment. Another variety, called Mexican onyx (not to be confused with the quartz variety of onyx), is used as an ornamental stone that is carved into figurines and other decorative items. ↑ Being polymorphs, they have the same chemical composition but different crystal structures. Mindat.org. 2007. Calcite Mindat.org. Retrieved December 2, 2007. Mineral Gallery. 2006. The Mineral Calcite Amethyst Galleries. Retrieved December 2, 2007. This page was last modified on 23 December 2016, at 16:56.